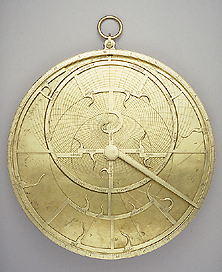 Epact: Astrolabe unsigned, late 15th century ? This Gothic instrument is neither signed nor dated, but the shape of the letters and numerals suggest that it was made in the second half of the 15th century. It is of the Fusoris type and may have been made in France.